Christmas in July 2017: Mitchell Hadley, from It's About TV! Easy answer here - Edmund Gwenn from Miracle on 34th Street. He convinces you that Santa Claus not only has a British accent, but should have one. His interaction with children is marvelous. Runner-up: Fred Astaire in The Man in the Santa Claus Suit. Santa should be omniscient, don't you think? from 1967's Christmas episode of Dragnet. Tough one, because most of the series television I've watched doesn't really offer a Christmas episode, per se. (I don't think I've ever seen "a very special episode of The Fugitive, for example). But I'll go along with "The Big Little Jesus" on the classic Dragnet because it avoids excess sentimentality, and gives us a chance to see Friday and Smith working this job just like any other. Until you get to the end, you really fear for the criminal who has to explain his actions to Friday! Only during the holidays. For me, Christmas is a time of great anticipation, and it's always been inextricably intertwined with sensations - the weather turning cooler, the sun setting earlier, snow on the ground (at least in Minnesota), decorations going up (even though that seems to happen earlier every year), Thanksgiving. Personal opinion only, but for me if the anticipation is drawn out too far, it loses its appeal. Besides, Advent doesn't start until the end of November! A combination of my own DVDs and streaming services such as YouTube and Amazon prime. I like to think I've got a pretty good collection of classic movies and television shows, but it's always fun to find more and more obscure specials from the '50s and '60s online. It's nice to have something new to look forward to each year, and we've been fortunate enough in that respect that we don't even try and watch everything every year - if you feel like you have to force it in, it just isn't as much fun. Wonderful question! I'll say (1) Amahl and the Night Visitors, because I've written enough about it that I have a reputation to defend, (2) the "Christmas Through the Ages" episodes of The Bell Telephone Hour, because they remind you of what Christmas really did feel like once, and (3) a tie between We're No Angels, because it's a terrific Bogart comedy and there's great interaction between the "angels," and Miracle on 34th Street, which is such a good satire on so many levels, from the law to psychiatry to child development. It's really a very sharp commentary on our times, which makes it more than just a Christmas movie. Interesting answers. I wonder if Joanna will do a post at the end of the month and tell us which Santa was the most popular out of all the posts? Seems like Edmund Gwenn might have the lead! I know for me it isn't Thomas Mitchell. 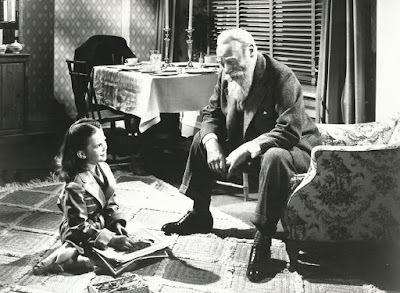 I saw the 1955 tv version of "Miracle on 34th St.", and I thought, while he made a terrific Uncle Billy for "It's a Wonderful Life", he was terrible as Santa, beaten out by miles by both Edmund Gwenn & Sebastian Cabot (from the 1973 tv remake). In a few ways, I prefer the tv remake to the 1947 original. I love seeing so many people I know from tv (James Gregory, David Doyle, Jim Backus, etc.) in it, and I thought David Hartman was much better as Fred than John Payne, at least showing more of a range of emotion. And it has never occurred to me to think of Miracle On 34th Steet as being the social satire that it OBVIOUSLY is, now that you've pointed it out-! It's quite unsparing, isn't it? Along with your list of targets would be the rampant, insincere commercialism (even in the late '40's) of the retail industry ("Make a buck, make a buck-- even in Brooklyn it's the same thing! "); office politics; and even the lowly postal-sorting-line worker ("I mean, why should these letters be OUR problem??" -- or something to that effect. Heck, Kris is saved because these guys were looking for a way to pawn off all of the "Santa" Dead Letters onto someone else--). Thanks, Humanbelly! 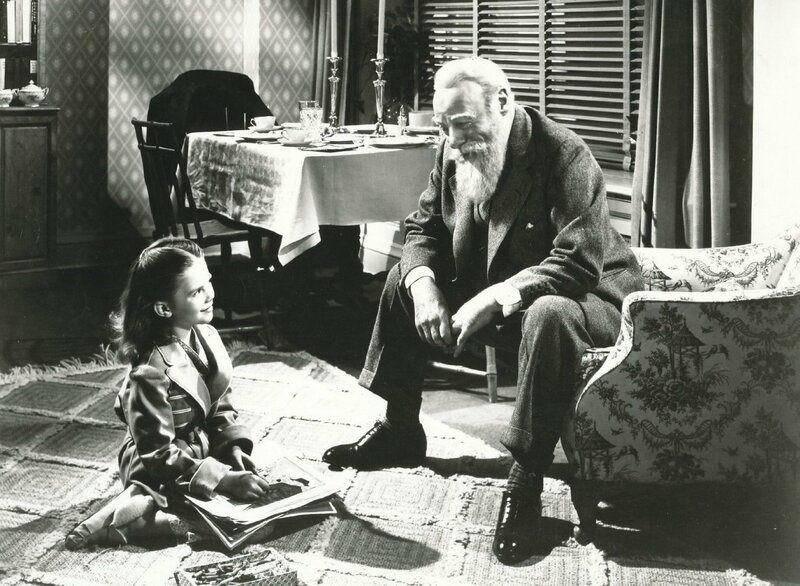 One of the reasons I love Miracle on 34th Street is that it is satire, rather than just a heavy-handed polemic on various social ills. Remember the line about politicians:? Very subtle - "Maybe he's only a little crazy like painters or composers or some of those men in Washington." 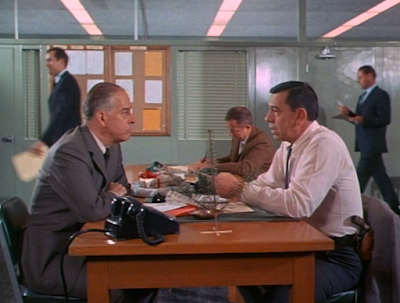 And you're right about Dragnet - Big .22 is just as depressing on TV as it is on radio. Some great responses (I'm with Mitchell on Edmund Gwenn). How nice to see "Amahl and the Night Visitors" as the answer to #5! Thanks, Rick. 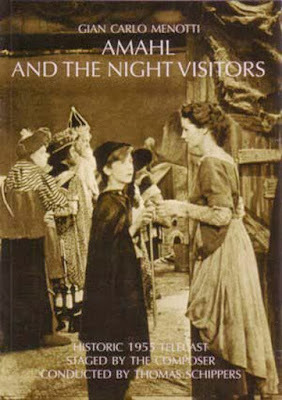 There's a new version of "Amahl" that I'm checking out this year - it's(hopefully still) on YouTube, and it's the version that Menotti hated so much, with Kurt Yaghjian as Amahl. It really would be nice to see a commercial release of that one. Again, I love that Edmund Gwenn from Miracle on 34th Street also captured your heart! I'm unfamiliar with Fred Astaire in "The Man in the Santa Claus Suit." Since I adore Fred Astaire - I will definitely have to check that out! Anyone know, is it ever on TV at Christmastime? Enjoyed all of your interesting responses!!! Net, I think it's on YouTube somewhere. Not only does Astaire play multiple roles in the movie, there are even more roles he's alluded to having played without actually saying so. He just oozes charm! Thanks as always for the invitation, Joanna! As long as you continue to host, I hope to continue to participate!